The animations show the temporal evolution of the phase profile of propagating oscillating phase kinks in a comoving frame. These spatial phase profiles are computed from solutions of the one-dimensional periodically forced complex Ginzburg-Landau-equation (CGLE) by integrating over the phase gradient. The unstable kink profiles have been computed with the help of a travelling wave ansatz. For the periodically forced CGLE that ansatz leads to a system of four first-order ordinary differential equations. The kink profiles can be determined from homoclinic connections between a 2-dim stable and a 2-dim unstable manifold of a saddle. For the continuation of the homoclinic connections I used the software packages AUTO 97 / AUTO 2000 by Doedel et. al. The first example shows an oscillating kink profile evolving from an oscillatory unstable profile (red line in the mpeg). A coexisting unstable kink profile (saddle) is indicated by a green line. The oscillatory unstable initial profile propagates with constant shape and constant velocity. The temporal evolution of the kink profile ends up in an oscillatory kink, i.e, a kink propagating at constant average velocity and with a periodically varying shape (Fig. 5a, 6). The second example shows an oscillating kink in the kink replication (backfiring) regime close to the transition to oscillating kinks. The kink replication process has been described in Chaté, Pikovsky, Rudzick, Physica D 131, 17-30 (1999). The kinks are unstable and disappear via the ocurrence of a defect. The residual perturbation grows and leads to the creation of a new pair of kinks. 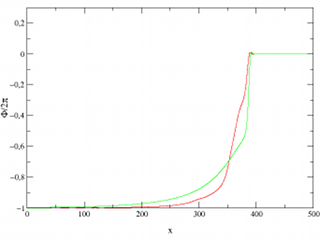 As in the first example the initial condition is an oscillatory unstable kink profile (red line in the mpeg) and the green line denotes the coexisting saddle kink profile. After a transient with growing oscillations the periodic kink replication process with the destruction of the kink can be observed (Fig. 5b). 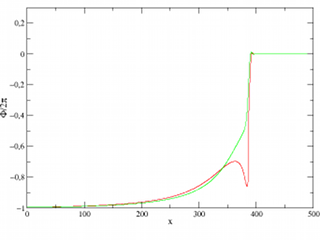 Between two subsequent kink replication events the unstable profile (red line) remains for a long time close to the saddle unstable profile (green line). Note that the destruction of the kink in a defect changes the phase winding number of the profile from 2π to 0, leading to a discontinuity in the sequence of phase profiles.